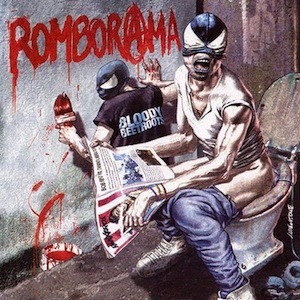 In the hour and 21 minutes that I spent with The Bloody Beetroots today, I found a whole lot to be annoyed with. From the album cover to the band members themselves, there’s very little to love in some of the most contrived stuff that I’ve ever had the misfortune of hearing. Let’s start with the basics. Romborama is flat-out annoying. Recommended to me because of my recent love of Justice, this record embodies almost everything wrong with modern electronic music. Honestly, it’s just a few “killer drops” away from donning the brostep label. I felt like I should have been listening to this album through Skullcandies, while fuming about how no one understands my obscure taste in music. In all candor, most of my rage is probably caused by this album’s beyond-unnecessary 80-minute length. There’s nothing quite as self-indulgent as releasing an extremely long album. An album this long is something that only well-established bands can get away with, and even then it is usually pretty obnoxious. My guess is that these guys wanted to put a lot of possible single candidates out there. With zero flow and its extreme repetitiveness, there’s no way that this monstrosity is intended to be listened to as a whole. Let’s not forget that the members of The Bloody Beatroots wear Venom masks on stage when performing. While I would never actually find that endearing, the fact that I hate their music only makes it more annoying. I can see it now, these two dumbledores standing behind their laptops and drum machines, bobbing their heads to the music that their drunken teenage fans can’t get enough of.